When you are a New York City-based birder that is pretty pleased with the amount of boxes ticked off on your New York State checklist you would normally want a rarity that you have not seen in the state to show up within an hour drive of your home. But you do not want this to happen while you are outside of Philadelphia and facing hours of rain-slowed traffic just to get back to New York City, especially when the bird in question, while within the one hour radius of home, is on the northern edge of that radius. But that is what happened on Tuesday evening and I had to suffer the email reports, pictures, and facebook status updates of New York State birders who were fortunate enough to see a Northern Wheatear, a bird I had never seen in North America, at the Croton Train Station in Westchester County. To add insult to injury, those evil Cornell-affiliated birders had spotted a Franklin’s Gull up in Ithaca as well so I got to be inundated with information about a second state rarity, and this one a bird that I have never had the pleasure of spotting. This situation simply could not stand. The Northern Wheatear at least had to be mine. Because I did not have to arrive at my office in Emerson, New Jersey until 9:30 AM on Wednesday I planned a pre-dawn assault on the Croton Train Station, which, timed correctly, would give me over two hours with the bird before I had to skedaddle off to the salt mines for another day’s labor. When I woke up in the middle of the night because of heavy rain somehow being channeled onto what sounded like a series of pieces of sheet metal in back of my apartment I didn’t think anything of it. When my cats meowed incessently outside the bedroom door at four in the morning and I got out of bed to chase them off and heard rain pounding on the roof I refused to acknowledge that my plans needed altering. When I got out of bed for good at five and heard rain hitting the bathroom skylight over the sound of my shower I pretended that this would have no effect on me whatsoever. Driving north out of Queens on rain-slicked roads, bleary-eyed and squinting through rain and spray kicked up by trailer trucks, I realized that my plan was seriously flawed. The flaws became more apparent when I turned on 1010 WINS radio for the traffic report and heard tale of a slew of road closures due to flooding between me and the wheatear. I briefly considered turning tail and heading home but decided that discretion is the boring part of valor and I pressed on, heading north on the Major Deegan through the Bronx because it seemed like the only major north-south route not flooded. I was lucky that the Sprain Brook Parkway was only flooded in its south-bound lanes because I managed to take that north to the Taconic State Parkway and then it was a clear shot up 9N to Croton-on-Hudson, where commuters were pulling into the parking lot for their train ride to work while I was pulling in to look for a rare bird. Two other birders were already searching in what had become a light mist when I arrived at 6:30, and neither had spotted the bird. I was pleased that Gail Benson was one of the two and amazed to learn that the Northern Wheatear would be a state bird for her. She introduced me to Michael Bochnik, the other birder on the scene, and a life-birder for me. We searched and searched and searched the south end of the parking lot where the bird had been seen the day before and had no luck at all. 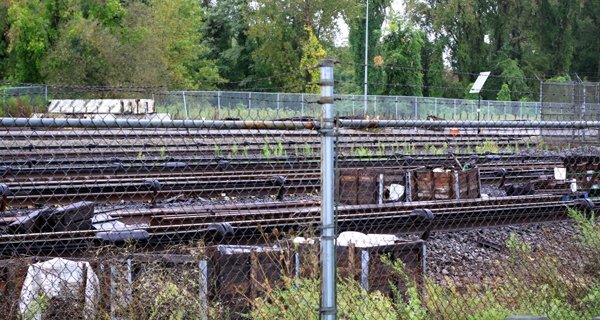 The habitat was amazingly lousy, with train tracks and asphalt making up most of it. Eventually Gail and Michael gave up and headed for work but I stayed behind, hoping that they would serve as sacrificial birders and allow me to get my ABA-area lifer. No dice. Another birder, whose name I have forgotten, showed up, and we were pleased to see a Willet fly past, an impressive bird for that far up the Hudson River, but disappointed by the lack of a wheatear. He gave up and headed off to work as well while I decided I would take a quick spin through Croton Point Park, adjacent to the train station, to see if I could find the bird in a different spot. No dice. I decided on one last attempt at the original spot and when I returned I was happy to see a few more birders, including Tom Burke, who was first to spot the bird as it flew past us a few minutes later. Northern Wheatear! Oenanthe oenanthe! Whoo-hoo! We managed to get in touch with Gail and get her back to enjoy her state bird and I got to get some digiscoped pictures which came out alright, I think, despite the continuing rain and gloom. Seeing a species in New York that is much more common in Eurasia and that only has North American breeding grounds in far northeastern Canada was pretty awesome. And I even got to work on time! And here, for the heck of it, is an image of the last Northern Wheatear I saw – a breeding plumaged bird in May of 2009 in Kazakhstan. It’s nice when persistence pays off, isn’t it? Good for you! Good for you! Unfortunately, by the time I arrived at 5:15pm, it was nowhere to be found. As the sun started to drop, a swarm (?) of dragonflies arrived, and about five minutes later, a flock of common nighthawks appeared. That was a great consolation prize. I hope you’re sneaking that Wheatear to Lakeside in your luggage. I won’t question the provenance. Great shots in the conditions. I really must try this digiscoping lark. @Jeremy: I am not sure if it was persistence or willful stubbornness, but it did work. @liz: A nice flock of nighthawks is a pretty cool sight. I wonder if you weren’t seeing a large ant hatching – we had a ton of ant swarms in flight on Long Island yesterday. @Robert: I’ll try luring it in with some wheat beer. @Redgannet: It is a great way to photograph. Gripping story and awesome pre-work tick! Good thing those sacrificial birders showed up and then left. That does seem to be true about the “sacrificial birders.” I’ve offered myself up as the sacrifice a few times, and I’ve seen my share of sacrificees. I’ll have to start making special notes to more fully flesh out this fascinating aside in the birding culture. Congrats, Corey! Beautiful shots. Hope my birding friends from home got to partake as well. Also, don’t knock the train station lot entirely … the lagoon at the far end hosts lots of wintering ducks, and the Bald Eagles seem to like to nest in the trees on the opposite side. This was the easiest Life Bird ever. It was raining but I made the 20 minute drive anyway. When I pulled into the parking area, the Wheatear was sitting on chainlink fence 12 feet in front of my car. Didn’t even have to get out of the car. It only stayed for a minute,then flew. In some way it was an unsatisfactory sighting. But it was a life bird so it counts. Went back the next day when the weather was better. The bird stayed a few hundred feet away. Needed a scope to get a good view. Fortunately there were two dozen birders around with many scopes. Hi Corey, My first time to this site, so glad I found it. I’m in Queens too and recently added some feeders to the yard of my landlady (she’s away and I hope she allows them to stay). I have my binoculars, and I keep track every day as to who visits. I am very close to Alley Pond park, plan on some morning visits there. Just this morning a downy woodpecker landed on the fig tree, usually the squirrels claim that tree, so got a good view! Many years ago the parrots who roost in Brooklyn came through our neighborhood, or perhaps it was another crate of parrots from JFK that freed themselves..it was loud and wonderful! 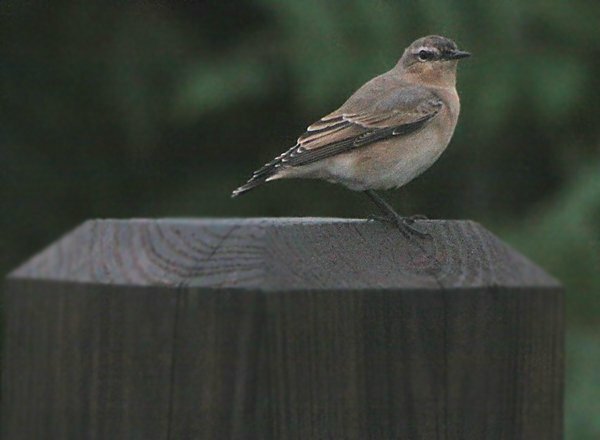 Great story about the wheatear. Love your photos!